This week the Fab4 discuss what things they love the most about Epcot and things that are their least favorite. Episode 67: What new ideas do you have for Disney Cruise Line? The week the Fab4 discuss the new Disney Cruise Line ships coming on board starting in 2021. They have some ideas on new features they would like to see added. This week the Fab4 share some of their favorite magical memories from Walt Disney World and they discuss a new way that WDW is addressing bathroom issues. 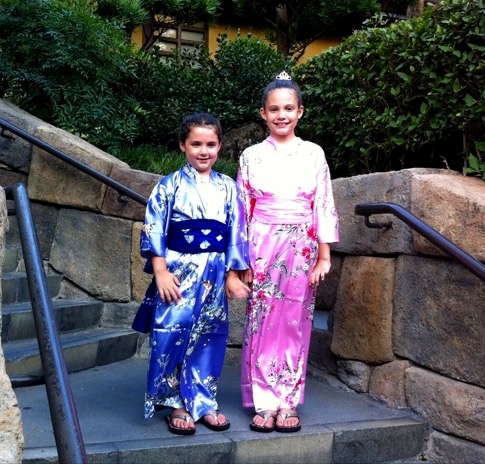 Maddie and Amelia after getting kimonos in the Japan pavilion. This week the Fab4 discuss their very recent trip to Universal Orlando. This week the Fab4 discuss the latest news released from Walt Disney World and a little snippet of Disneyland. This week the Fab4 discuss the idea that Walt Disney World is designed for girls more than boys. What could be more fun than sailing the high seas and meeting your favorite podcasters! Join the Fab4 in Feb 2020 on the Disney Magic for an extra fabulous good time. This week all 4 of the Fab4 are back and they are just shooting the breeze and discussing the latest theme park news. Unfortunately, Kristy is out sick this week but the other 3 podcasters hold down the fort. This week they discuss what they miss at Walt Disney World. This week it is only Eric and Kyle hosting. To say the guys got off topic is an understatement. This week the Fab4 discuss new things coming to Walt Disney World in 2019 but not Galaxy's Edge. This week the Fab4 recap Gina & Kyle's trip to Walt Disney World over Christmas. The week the Fab4 discuss Eric & Kristy's recent trip to Walt Disney World. This week the Fab4 discuss various topics ranging from the Millennium Falcon to shoes. This week the Fab 4 discuss what type of resort they would build at Walt Disney World. Episode 51: What is worth the wait? This week the crew kinda talk about which rides they think are worth waiting for and how long they would wait. The week the Fab4 play the game Things. Tune and see what "Things" from Walt Disney World the host pick.